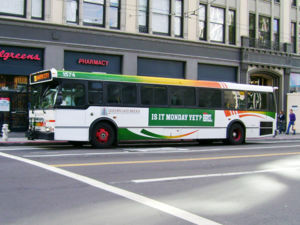 Golden Gate Transit is a regional bus system in Marin and Sonoma counties. It connect cities in both counties with San Francisco, as well as connecting San Rafael with Richmond and El Cerrito. Golden Gate Transit connects with BART, Amtrak, and Sonoma-Marin Area Rail Transit. Marin Transit provides local bus service in Marin County under its own brand apart from Golden Gate Transit. Golden Gate Transit is a bus division of Golden Gate Bridge, Highway and Transportation District, which also operates Golden Gate Ferry.